Their frantic drumming is a familiar sound of summer. But just how woodpeckers endure millions of head-banging episodes in their lifetime without suffering from brain damage isn’t understood. With each peck, woodpeckers experience a G-force, or force of acceleration, anywhere from 1,200 to 1,400. And they do this hundreds of times a day, millions of times in their lifetime. In contrast, just 60 to 100 Gs can give a person a concussion. New research has discovered that the brains of woodpeckers do indeed contain a buildup of a protein found in people with brain damage and some neurodegenerative diseases. The protein tau is essential to the function of neurons. 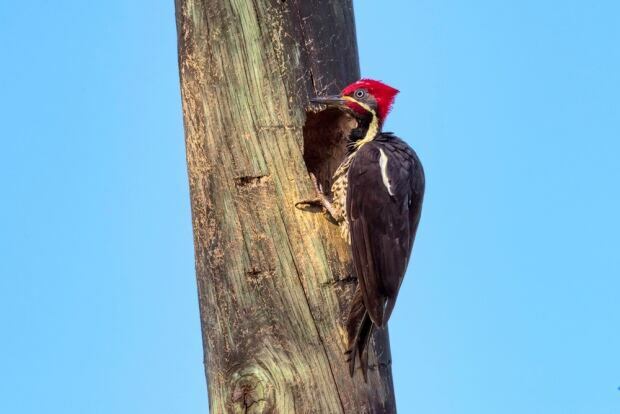 However, recent studies have found a link between patients with traumatic brain injuries and a buildup of this particular protein, which is why the researchers chose to examine woodpeckers. George Farah, lead author of the new study published in the scientific journal PLOS ONE​, was a graduate student at the Boston University School of Medicine and wondered if the brain of a bird that’s been around 25 million years also produces the protein or if its brain has adapted somehow to the repeated impact. It turns out it’s both. “I didn’t think we were going to find anything,” Peter Cummings, Farah’s adviser and co-author of the study, told CBC News. “We found tau — what it means, I don’t know,” Cummings said. That’s because scientists had come to believe that woodpeckers wouldn’t have an accumulation of tau in their brains. After all, their bodies have undergone evolutionary adaptation, such as changes in the beak, the neck muscles and the skull over millions of years. Their research found eight of the 10 woodpecker brains obtained from Chicago’s Field Museum of Natural History and the Harvard Museum of Natural History contained elevated levels of tau. None of the control birds — red-winged blackbirds — contained elevated levels of tau. Despite the findings of tau accumulation, the birds don’t exhibit any behaviours suggestive of brain damage. And this is what the researchers hope to further investigate, with the aim of better understanding the role it plays in brain damage in humans. Not all tau is created equal. Cummings explained that some types of the protein are protective, while others accumulate and can become toxic. Could the woodpeckers have the protective form? Or could they have something entirely different that prevents them from suffering neurological repercussions? That’s exactly what Farah hopes further research will find. “A population of 10 is a good number for an initial study, but if I wanted to conclude something about these birds I would want a larger sample size,” he said. The next step will be to find out what kind of type of tau it is or if there’s a binding protein that helps stabilize it.